Get temporary relief from sinus congestion and sinus pressure, day and night. 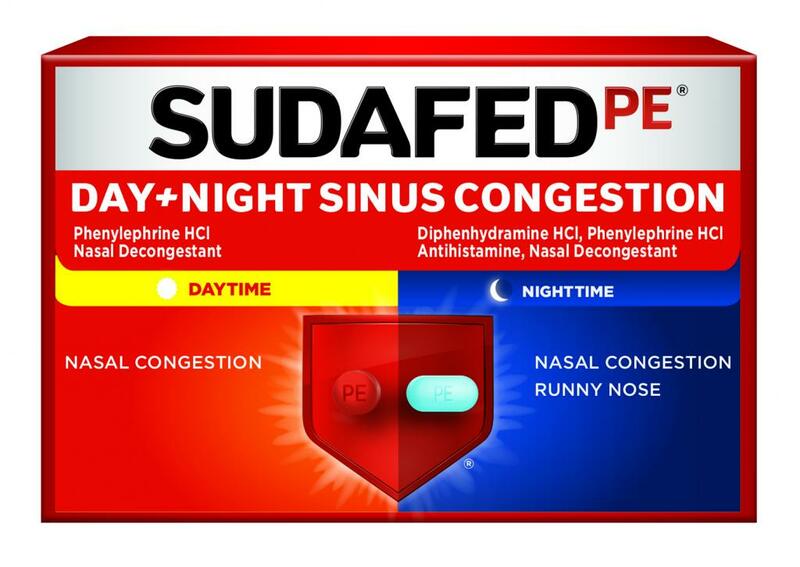 SUDAFED PE® Day + Night Sinus Congestion temporarily relieves symptoms of the common cold, hay fever and other upper respiratory allergies. If I could give this zero stars I would. I've been suffering for the past 2 days and this has done NOTHING to relieve my symptoms. Not even slightly. I've tried both the morning and night time and nothing! I have severe nasal swelling which this product does not help with in any way - day or night. The only thing it helps with is drying up your sinuses. Would not recommend at all. We’re so sorry to hear about your experience with our Sudafed PE Day + Night Sinus Congestion and we’d appreciate the opportunity to gather a few more details about your experience. When you have a moment, please give us a call at 1-800-223-0182 between the hours of 9:00 AM – 5:30 PM ET, Monday – Friday. We hope to hear back soon! We want to learn more about your experience. Please give us a call at 1-800-223-0182. We're available Monday-Friday 9AM-5:30PM ET. When you call mention your username to our team. We hope to chat soon! I bought Sudafed Day + Night Sinus Congestion and was perplexed to find no directions or recommended doses. The box says “Do not take more than a total of 6 tablets in a 24-hour period. Take only as directed.” Directed where? There is nothing, inside or on the outside of the box, to advise how many to take and how often. I see on your website that the answer is one every 4 hours. You might consider including that on the packaging. Thanks for letting us know about this! We'd love to learn more about your experience and see how we can help. When you have a chance, please give us a call at 1-800-223-0182. We're available M-F, 9AM - 5:30PM ET. We're looking forward to hearing from you! I think too much credence is put into what these pills are supposed to do. I bought these pills because my nose was running like a faucet. Within an hour my nose was no longer running. I take 1 pill around 10-12 am when I can get up (muscle aches) keep me in bed in the morning. And one in the evening 8-10pm. My nose has stopped running. This medication does not address the head cold part at all. I feel like my head is an overfilled balloon. Had shakes, chills, night sweats, and fever with dissiness last two nights 3 days total now and writing this before going bed on the 3rd night. I have little to no cough. Took a flu shot this year about two months ago. Feels like a mild flu. Very intense last few days though. Only other think I’ve take is a few ib profin (400mg) every 12 hours . Before bed mostly. I may not take any tonight. Thank you for sharing your feedback with us! We're so sorry to hear our Day + Night Sinus Congestion didn't help to relieve the symptoms you were experiencing. We'd like to learn more about your experience and help to make this right. When you have a moment, please give us a call at 1-800-223-0182, we're available Monday-Friday from 9a-5:30p ET. Hope to hear from you soon! When questioning whether to take the red pill or the blue don’t even bother with the red pill. It’s like a placebo. It does absolutely nothing for you although you may be thinking something is happening, it is not. Just go straight to the blue pill. It’s the one that works. Total sham and the reviews below confirm just that. Thanks for taking the time to write this review! We're sorry to hear that the red product isn't working for you,while the blue is. We want to learn more about your experience with both of the, and see what we can do to make this right. Give us a call at 1-800-223-0182, Monday-Friday between 9A-5:30P ET. We look forward to hearing from you! Daytime did not help me. Will now try Nightime. Where on package is dosage? All I see is not to exceed 6 in 24 hrs. and not to combine day/night tablets. Thanks so much for giving our product a try. We're sorry to hear about your results and we want to help you with the packaging question you have. When you can, please call us at 1-800-223-0182, Monday - Friday, from 9am to 5:30pm ETand mention your review title. Thanks!